We can all agree that 2015 and the start of 2016 has been anything but glamorous for the oil and gas sector. Down markets demand budget reconfigurations and tightened spending, and this is especially evident when it comes to marketing expenditures. The natural tendency might be to lessen or eliminate marketing efforts and wait out the storm, but I am here to tell you that is not your only option. 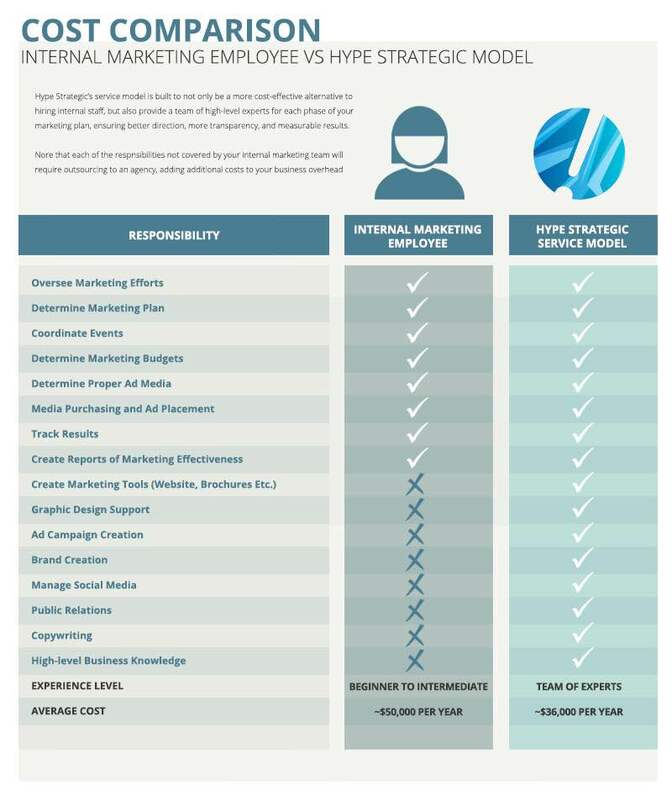 Below is a Cost Comparison model that illustrates the difference between internalizing your marketing team, and hiring a third-party, full-service agency to carry out your company’s marketing goals. As you can see, even with a higher base cost, the internal staff is still not able to execute the entire list of duties, requiring you to outsource those tasks and add additional business overhead. Hype Strategic’s service model was built with the keys to company growth and brand awareness in mind. Not only do we have the means to deliver higher-level marketing services through our team of experts, but we are able to offer them at a lower cost than paying a full-time salaried staff. Hype Strategic is ready to help the growth of your company in 2016. With silence, uncertainty, and reduced activity across the competitive landscape, now is the time to gain market share by making noise with your brand. Call us today!